It took us a bit of time, but we are finally able to help those in the motorcycle community. We have had many calls for motorcycles over the last couple of months. Looking at the rigs that are available for purchase, I just wasn’t confident in their quality, and many were really expensive. Well, with all of that rolling through my head, I decided to see what it would take to build one from scratch. After a trip to the steel scrap yard (A metal playground! ), I was able to round up all of the needed pieces to start the project. A little cutting, welding, grinding, and painting gave way to an awesome contraption that holds the front wheel of motorcycle so the bike will stay upright and can be strapped down. The rig serves as the connection points to the bridle so the bike can be hauled up onto the bed just as a car or truck would be. We tested this with my buddy’s bike, but I didn’t take pictures. Sorry guys. We’ll get photos up ASAP. The photo that’s included is before the welds were ground and it was painted. It is now a smooth rig with a tan finish. 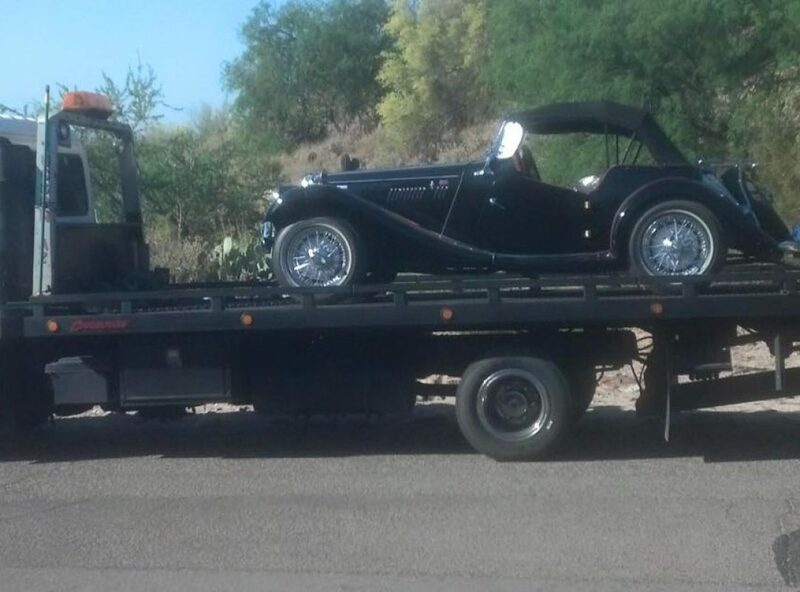 Motorcycles, like high-end/classic cars, require TLC; especially when hauling/transporting them. I wanted to make sure the rig I use is safe, strong, and reliable for the customer, and for myself. Thank you for allowing us to serve you. We’ll get photos with a ride in the rig posted as soon as we can.